Edward Snowden is a thief cultivated by the Russians. Now Panic. Those of you who know me, know that I am usually quite ready to defend Edward Snowden. You may have been reading this blog or listening to me going on about how I believed he did something brave and honourable and that he should be applauded and not punished. You may have read about my belief that the act of applying for, and being granted, asylum in Russia says nothing about Edward Snowden’s true motivations and everything about how the US and other nations handled the situation. People who follow me on Twitter or Facebook, whether they liked it or not, have watched me share material about the potentially unlawful practices of the NSA and the British GCHQ and have witnessed my indignation at governments like German chancellor Merkel’s administration for keeping still instead of standing up to the US. You may have heard and read me call for Mr Snowden’s protection, his pardon, you may have witnessed me going on about his right to asylum, condemning those who would deprive him of that right and those who would not help him. I believed in Snowden from the start. I was around for that live Q&A with Snowden this week, and I wasn’t impressed. It has caused me to reconsider what his opponents have to say and I think I now see who the real Edward Snowden is at last. And based on that evidence, Edward Joseph Snowden, former employee of NSA contractor Booz Allen Hamilton, I say to thee: thou art a villain. Thou art a rogue, a knave, a traitor, guilty of the most heinous crimes. Yes, I finally see it! Mike Rogers, chairman of the US House Intelligence Committee, has opened my eyes to your knavery! I believe there is a reason, Edward Snowden, for why you “ended up in the hands, the loving arms, of an agent in Moscow,” and for why Russia has now hinted that it will extend your asylum. It doesn’t matter that I have no idea who that agent with the loving arms is supposed to be or what the hell Mr Rogers is talking about, or that he has “offered no firm evidence to back his theory”. It makes no difference either, that the FBI still thinks you acted on your own and that Richard Ledgett, the senior NSA guy investigating the leaks, agrees with them. Clearly, the things you did, Edward Snowden, were “beyond your technical capabilities”. Diane Feinstein, defender of the NSA and my new favourite person in the world, says the same thing: you may well have had help. She doesn’t really know. No matter. So she cannot prove it. Who cares? If one does not have the slightest evidence to support a claim but does not believe the evidence supporting the opposite claim, one might as well assume that one is right. Especially as one’s claims are lapped up so readily by one’s friends in the media. After all, someone who would shamefully abandon his girlfriend – a grown woman in the 21st century – to fend for herself and abscond first to China and then to Russia must be capable of all sorts of evil acts! Undoubtedly, it must have happened during your time abroad. After all, living in Switzerland, that homeland of rich racists, must have made you appreciate the perks of some good old-fashioned Communism. Was it there that the seed of treason was planted inside you, Edward? The seed that then grew and turned you into a fully-fledged double-crosser ready to sell your country and manipulate your colleagues into giving you their passwords? Oh thou master of manipulation, no wonder I fell for your ruse! I now name thee thief! I name thee stealer of “information that had to do with how [the US] operate[s] overseas to collect information to keep Americans safe”. And I turn my back on thee! Obviously, I am not being serious. And I don’t believe I had you, dear readers, for a second. After all, these latest allegations that Edward Snowden “may have had help” from Russia when taking away the NSA’s toys are no less unfounded or any less ridiculous than previous, similar ones. They are, in fact, more so. Justin King calls them “a bi-partisan effort to scare the American people into ending their opposition to the surveillance state”. He is not wrong. It cannot be a coincidence that this kind of Snowden-bashing gained new momentum in the wake of Mr Obama’s speech last week. Having tried, I can tell you though, that it is very, very difficult for any reasonable person to uphold claims that Mr Snowden is a Russian (or any other nation’s) asset. Now, the spooks though…. They seem to have quite a lot they would like not to become known, don’t they? The decision “has raised suspicions within the ACLU that the government continues to hide bulk surveillance activities from the public.” Other, different bulk collection activities than those that we (courtesy of Mr Snowden) already know about, that is. So you cannot get information on the number of classified documents that are being withheld in court because the number of documents itself is classified information. Wow, that must be quite some information! What could we possibly, I wonder, infer from a mere number? Except perhaps that there is far too much indiscriminate surveillance going on. Not that we didn’t know that already. Now consider who is hiding what here (and who is making unfounded allegations against whom and who is calling for whose assassination) and then ask yourselves who the real knaves are in this drama. Free speech – now here’s a thing: Edward Snowden has provided us with the information we need to have a free and informed debate. The US government says it welcomes this debate. Yet, they are still withholding documents vital for that debate and are calling for the prosecution of the man who enabled that debate. Most recently, they have called for him to enter a guilty plea. More on that in a moment. Seeing that they cannot – for the moment – lure him back or get their hands on him by legal means, they are clearly and blatantly trying to discredit him, failing at every turn to base their allegations on any solid evidence. To me, the shenanigans of Ms Feinstein, Mr Rogers and Mr McCaul display the same sort of desperation and frustration so sickeningly evident in the spooks’ murderous hatred for Mr Snowden. Now, who are we to believe? The man who, to all intents and purposes and according to all available evidence, is a whistleblower, or the people with questionable motives and worryingly skewered ideas of morality who are trying to discredit, incarcerate, murder him? Would you trust a Peeping Tom when he told you that everything he was doing was perfectly within the law? And that the person warning you that he was outside your window every night looking in needed to be brought in front of a judge for doing so? And I am sorry Ms Feinstein, Mr McCaul, Mr Rogers, but the case you are making against Mr Snowden won’t stand. It cannot be upheld because there is no evidence that your allegations that he had outside help when outsmarting the NSA have any basis in fact. There is, however, ample evidence that you and your associates are not as trustworthy as you profess to be. Which, of course, explains why you keep banging on so loudly about Mr Snowden and Russia: people who are not quite sure of themselves are often hide their insecurity behind a veil of noise. And you have every reason, don’t you, especially this week, to feel a little bit insecure about yourselves? And particularly about that bulk phone record collection programme under section 215 of the Patriot Act that you like to defend so much? And there are many people who agree with this. The Guardian has a list of quotes here. As such, the Privacy and Civil Liberties Oversight Board’s report sounds a lot more promising than most of what Mr Obama said in his speech last week. This is something we all needed to know about and there is no reason, or evidence, to believe that Mr Snowden disclosed information about this programme for any other reason than because he was troubled by what he saw. Which brings me back to the repeated allegations that he is a Russian spy. Note that every report on these allegations – be the reporting media government friendly or no – has to concede that neither Ms Feinstein, nor Mr McCaul, nor Mr Rogers has given any evidence to support their claim. That sentence runs like a bright red – dare I say scarlet – thread through every article and commentary on the story. Feel free to check this here and here and even with that mother of all Republican party extensions Fox News. So whereas Mr Snowden’s motives continue to seem sound rather than dodgy, and while his decision to reveal these mass surveillance programmes seems more vindicated each day, what about those of the NSA and their minions? Ah, here is the hitch, you see? Because there are some very questionable characters among them. And they have some very scary things to say on the subject of what they would like to do to Mr Snowden. Now. Giving Mr Snowden an official forum to speak and to address the charges made against him may sound like a good idea in principle. In practice, however, it really doesn’t sound that good at all. Being charged under the Espionage Act, Mr Snowden’s chances of properly arguing his case are perceived to be rather slim. “These statements [that call for Mr Snowden to make his case in court] belie a fundamental misunderstanding about how Espionage Act prosecutions work,” Trevor Timm of the Freedom of the Press Foundation writes. Examples of this are Thomas Drake and, most recently, Chelsea Manning. Sound good or fair to you? No, not me either. Allow me to dwell on that Q&A session for a little because I think Mr Snowden made some important points which I would like to quote here. …. The NSA and the rest of the US Intelligence Community is exceptionally well positioned to meet our intelligence requirements through targeted surveillance — the same way we’ve always done it — without resorting to the mass surveillance of entire populations. There is certainly no evidence of the megalomania or naïveté that his opponents accuse him of. That current, serving officials of our government are so comfortable in their authorities that they’re willing to tell reporters on the record that they think the due process protections of the 5th Amendment of our Constitution are outdated concepts. These are the same officials telling us to trust that they’ll honor the 4th and 1st Amendments. Once, again Mr Snowden is right that “[t]his should bother all of us”. And even if these comments sprung up in the heat of a particular moment (which, given the nature of some of them, I sincerely doubt), then surely serving officials should know better than to speak them in public – to a news source no less. To be fair to Ms Radack, she made that statement a month ago and it was only on Thursday that Mr Holder made it clear that Mr Snowden might be able to expect some sort of bargain only in return for a guilty plea. The problems with that, of course – in addition to hysterical calls for assassination made by some members of the intelligence community – I have outlined above. So yes, things are definitely moving. The World Economic Forum in Davos this week saw the launch of an independent commission that is to “investigate the future of the internet in the wake of the Edward Snowden revelations”. The commission has been set up by Britain’s foreign affairs thinktank Chatham House and by the Center for International Governance and Innovation (CIGI), which is partly funded by the Canadian government. It will conduct a two-year inquiry. Rather, one of the major threats is indiscriminate mass surveillance conducted by so-called Western democracies. It is certainly promising that the US privacy board “plans in the coming weeks to issue another report evaluating the NSA’s collection of bulk foreign Internet communications, which have included those with Americans “incidentally” collected”, yet we must not forget that these can only be initial steps. For now, the US administration still considers the bulk phone record collection programme “lawful” and whistleblowers in the US are by no means well-protected enough. I strongly disagree with Alex Little’s assessment that Mr Snowden could get a fair trial in the US. I, for one, have little faith that any of the hypotheticals that Mr Little suggests as the conditions for such a trial have a chance of being realized. For now, both NSA surveillance and whistleblower protection are in dire need of reform. It seems that only when Mr Snowden is given full credit for enabling such reform – and giving due credit absolutely includes the right to fair treatment before US law, an end of death threats and false allegations – will he be able to even consider returning to the US. It remains to be seen if he is right on that count but it is doubtful that even if he is, his personal situation will be allowed to improve. So this Friday saw it then. The one we have all been waiting for. The one that has been both anticipated and dreaded by civil libertarians and the security services alike (albeit for different reasons): President Obama’s speech (full text here), announcing his plans for reforms of the NSA’s surveillance capabilities. A spoiler: I was neither very impressed, nor very surprised. What Mr Obama outlined on Friday has been variously hailed as “significant change” and an “overhaul” of the NSA’s surveillance activities. The New Yorker even lauds the speech as a “Major victory for Snowden and N.S.A reformers”. For all its pretty rhetoric and invocation of days long past, the speech offered nothing new or surprising, let alone “radical”. Rather, what it mostly did was try to reassure sceptics, the public, and foreign leaders about the NSA’s programmes; that they were not being abused, that a system of meaningful and effective oversight exists and – most importantly – that they are needed to keep people safe from terrorist and other attacks. Crucially, Mr Obama announced that he will leave that most controversial capability in tact; the bulk collection of telephone records under section 215 (and do not let yourselves be fooled by those who claim that he called an end to this programme either. He merely called an end to it in its current form. You will see shortly that this is no actual end at all). Now. I cannot be the only one who finds this irksome. Once again, between the lines, there is the implication that it is not the content of phone calls or names that is of interest but the metadata. This may have sounded reassuring six months ago. Oh good, we were supposed (and apparently are still supposed) to be thinking, the spooks aren’t listening to what I am saying. They are not sitting there eavesdropping on the secrets I exchange with my friends and family. Yet, by now anyone informed about this programme and the true meaning and implication of metadata collection becomes rather more concerned than reassured by this kind of statement. As has been repeated time and again, metadata is far more interesting and meaningful than the content of calls. It gives the people in possession of it far greater capabilities than the mere content could. It allows them to see who speaks to whom, for how long, and then who those people speak to after that. It allows for the mapping of everyone’s communications, for the establishment of connections, for the tracing of movements. It makes us all into little dots on a big map that can scrutinized at will. This may (be intended) to sound good in theory but in practice it means that every single one of our communications could potentially be mapped and that we could fall under suspicion simply because someone who has been in contact with someone else who may be considered suspicious then comes in contact with us. In practice, we could all show up on that map and be considered suspicious at one point or another in time. Of course, Mr Obama was quick to reassure people in his speech that mapping the movements of innocents is not what is being done and that this is not what the programme is for either. Firstly, “specific lead” seems to be a rather unspecific term. What constitutes such a lead and who decides that any lead justifies the querying of that data? Secondly, it is one thing for phone companies to retain the data for business purposes (and, mind you, no less worrying) but the government should, as Mr Obama himself admits, be held to a higher standard. Thirdly, evidence does exist that the database has been abused – and intentionally as well. Remember LOVEINT? And even if the violations aren’t wilful but the results of human error, there still needs to be a debate, I think, on whether we want all our communications to be stored in a way that allows for serious mistakes resulting in us becoming potential targets. This is where I feel that my view significantly differs from that of all those people who hail this as a massive step forward. Now, be careful with that one. The phrase as is currently exists already gives away that this is no uncompromising abolition of the programme or its mass storage capabilities. As Mr Obama said earlier on in his speech, he believes these capabilities are necessary. All he promises here is that the government will no longer store this data, not that the data will not be stored at all. And this is where it gets really tricky because Mr Obama admits that, for now, the government has not really worked out where the data is to be stored in the future or by whom. The NSA stores a bulk of telephone data. This data can be queried. In theory, a warrant is needed if any of those queries target US citizens. In practice it has been shown that the system of oversight that exists to prevent the targeting of American citizens is not as safe or reliable as it ought to be. Data will still be stored in bulk but by someone other than the NSA (and it is not yet clear who). A procedure is to be established that requires the NSA to obtain permission to query that data. I don’t know about you but to me that pretty much sounds like the same thing in a different box. One, instead of what has been called the “three hops” approach that allows people that are up to three calls away from any target to be pursued, from now on only people up to two calls away can be pursued. Well, given the previous security from government overreach (or lack thereof), I fail to be very impressed by this. Hence, rather than to abolish the programme, they made it legal. The same thing seems to be happening now. So basically, the chief spy is in charge of what information is made available to the public and it has been left to government to establish a panel of advocates outside of itself that is to advise the Fisa court on significant cases. Seems like the power to make significant changes to oversight remains mostly with people who cannot and evidently are not that interested in oversight at all. Take into consideration that there is still substantial opposition in Congress to the idea of reining in the NSA’s powers. As such, “the Leahy/Sensenbrenner bill” – the USA Freedom Act that would end bulk data collection – “still faces a significant challenge from lawmakers close to the intelligence community, who say Obama’s defence of the NSA supports their position. In fact, from the very start, the construction and rhetoric of the speech with its invocation of the war on terror, the cold war. and 9/11 hints to what the effective lack of meaningful reform makes very clear. First and foremost, this is a speech designed to “give the American people greater confidence that their rights are being protected” while allowing the “intelligence and law enforcement agencies maintain the tools they [allegedly] need”. What is still lacking is evidence of the effectiveness of the programmes, even though Mr Obama once again suggest that they have foiled a number of terrorist plots. However, “Obama’s own review group concluded that the sweeping phone records collection program has not prevented any terrorist attacks.” You can read up on this and five other questionable claims Mr Obama made in his speech here. What is also somewhat lacking is reassurance for people outside the US. Granted, Mr Obama took pains to reassure foreign leaders and foreign citizens that “the US only spies for national security reasons, only takes industrial secrecy of other nations when there is a pressing national security lead, and doesn’t spy on foreign citizens for prurient reasons”, but all of these assurances were rather vague, including as yet unspecified safeguards. I should also like to ask who determines what a “pressing national security lead” is precisely. In any case “steps do fall substantially short of what Obama’s review panel recommended”. “For example, Mr. Obama did not accept one of the most far-reaching recommendations of his own advisory panel on surveillance practices: requiring court approval for so-called national security letters, a kind of subpoena allowing the F.B.I. to obtain information about people from their banks, cellphone providers and other companies,” the New York Times reports. Thus, despite the rhetorical finesse of this speech, it remains to be seen how many meaningful changes to these programmes will really be made. They are not wrong. In the end, the speech was a defence of the NSA and its programmes. And reading between the lines of Mr Obama’s comments about Edward Snowden, it is hardly reassuring that the president, even in light of the necessary debate that Mr Snowden’s revelations have started, still does not acknowledge Mr Snowden’s actions as beneficial or necessary. Yet not only has Mr Obama’s government prosecuted whistleblowers in an unprecedented manner. More than that, the protections Mr Obama refers to do to extend to contractors. I have said this before and I am going to say it again: to acknowledge that a debate is necessary while at the same time blaming those who have brought this debate about is either a paradox or it betrays that you would have preferred not to have a debate at all, or, if you did, to have it on your own terms and within your own control. That, however, would not be true and meaningful debate at all. It is therefore not much of an acknowledgement that “this debate will make us stronger” because the question remains as to who will emerge stronger at the end of it. Given the unimpressive nature of the proposed reforms it might still be the NSA. And I am not the only one who thinks that Obama’s speech was mostly underwhelming. Mr Greenwald isn’t wrong when he writes that while the speech offers “positive steps [such as a] public advocate in the Fisa court, a loosening of “gag orders” for national security letters, removing metadata control from the NSA, stricter standards for accessing metadata, and narrower authorizations for spying on friendly foreign leaders (but not, of course, their populations)”, it was also dismayingly “bereft of specifics”. Similarly, the New York Times suspects that the president’s speech was “more calculated to reassure audiences at home and abroad than to force radical change”. What I wonder is whether mollifying the indignation felt by international leaders will not also serve the US’s end of further isolating Edward Snowden. Placated international governments may be even less inclined to see the value of Mr Snowden as a witness or the moral imperative that they have been trying to overlook for so long; that someone who made them aware of the US’s overreach deserves their protection and help. If we let ourselves be lulled into believing that this is it, truly meaningful reform is not likely to happen. That is what this speech is truly indicative of and we would do well to make ourselves aware of that. To conclude, some other news I felt were worthy of note this week. Firstly of course the revelation that the spooks are reading our texts. The project is called Dishfire and it is yet another example of how data is indiscriminately sucked up by the NSA and of how surveillance agencies circumnavigate restrictions placed on domestic spying. Feel reassured? Didn’t think so. More information on what the spooks potentially know about you and your travel plans here. Elsewhere in the UK, the Guardian’s Alan Rusbridger was interviewed on NSA and GCHQ surveillance. Two, “[h]e said that metadata – the details of who sent contacted whom, and when – could reveal “almost everything about you”. I repeat: maintaining that collecting metadata instead of content isn’t spying is to rely on a narrow definition of spying. You could also call it lying. Three, Mr Rusbridger repeated once again that “[t]here was no evidence for the “theatrical” claim by Sir John Sawers, the head of UK foreign intelligence agency MI6, that terrorists were “rubbing their hands with glee” at the Snowden revelations.” Just in case you were wondering if that was still a thing. And finally, it seems that I wasn’t wrong last week when I wrote that I am not sure a plea bargain or clemency that will see Edward Snowden’s return to the US is a good idea. I didn’t think it sounded safe. Cue Buzzfeed, which this week published comments by US spies who not only said they wanted Edward Snowden (the “traitor”) dead but also that they would be quite happy to do him in themselves. And they are sickeningly specific about the “how” of it as well. Let us be clear: there are no circumstances – none whatsoever – in which a human being can forfeit their right to life. Countries that have abolished the death penalty thankfully have made this principle law. It just doesn’t seem to have reached the USA yet. This outdated mindset needs to be changed urgently. There is something fundamentally wrong (and certainly completely outdated) about the idea of revenge or the belief that it is sometimes acceptable to take “an eye for an eye”, let alone a life for a life or, as in Edward Snowden’s case, a life for something that some people see as treason but others (myself included) see as a brave act of civil disobedience. People need to realise that taking another person’s life is inacceptable, and they need to do it quickly. But until they do, Edward Snowden is not safe in the US. Having said that, I encourage everyone to sign this petition to secure him asylum in Brazil. Let us stand with Mr Snowden and help make sure he stays protected! Edward Snowden: A Case for Clemency? I hope you all had a brilliant holiday and a great start to 2014. So, let’s dive right into the New Year, shall we? Well, 2014 certainly started off in as interesting a way as 2013 ended. Ahead went the New York Times and published an editorial calling for clemency or a plea bargain for Edward Snowden. This caused a lot of noise. The idea isn’t new. A deal between Mr Snowden and the US government, possibly in return for the documents Mr Snowden took from the NSA, was first suggested some weeks ago by Richard Ledgett, “[t]he NSA official in charge of assessing the alleged damage caused by Snowden’s leaks”. Personally, I think that the arguments in favour of clemency are sound: considering the service that Edward Snowden has done many countries and their people, not to mention that his revelations “have triggered a valuable debate, leading possibly to much-needed reforms”, I agree that he should not continue to be exiled or spend his life behind bars. However, given the vitriol that not only Mr Snowden but also the reporting journalists have met with, and the fact that any form or clemency would be subject to a deal to restrict or stop further revelations, I am not sure how good the idea is in practice. After all, Mr Ledgett has said that he “would need assurances that the remainder of the data could be secured, and my bar for those assurances would be very high. It would be more than just an assertion on his part”. I was quite interested by this debate (obviously) so I am going to look at it in a bit more detail. None of these allegations have been substantiated with evidence – nor can they be because the information necessary for that is – all together now! – classified. So, apparently, this is the piece that has been hailed as “a sharp well-argued rebuttal to The New York Times’ editorial”. Kevin Gosztola, who has quite successfully dissected the piece, correctly raises the point that all it really does is reiterate a number of arguments that have been floating around, none of which are very convincing and some of which have been proven false. These arguments don’t get any better, any more true or convincing simply because people keep repeating them ad nauseam. Which is what Kaplan does. And he makes several other very questionable arguments besides. That statement alone is flawed in so many ways. For one thing, I have always found worrying the (frequent) implication that it is somehow okay to spy internationally on a massive scale as long as your own agencies don’t spy domestically. Arguments like that are based on a too narrow and, might I add, egoistic and ignorant point of view. For another, it seems an ill-informed and naïve thing to say that none of these operations are illegal, improper and immoral. Or perhaps Mr Kaplan simply has a very different idea from mine about what is (il)legal, (im)proper and (im)moral. No it isn’t (Gosztola realises this, of course, he is being sarcastic). Which is precisely the point: arguments like Kaplan’s seem to suggest that as long as these things are not done domestically, they can somehow be considered moral and proper. But just because something is being done by your people outside your borders doesn’t mean it is subject to a different definition of morality or propriety . Violating the rights of the citizens of a nation that isn’t your own is still a violation, if not by law then by the ideas of propriety and morality that we believe ourselves to be subject to. Undermining the fight against polio is immoral, placing people on a kill list is immoral, “incidentally” collecting cell phone location data is immoral and – potentially – illegal. To concentrate solely on domestic surveillance when discussing the NSA is not taking things far enough. And in a global world it seems hardly appropriate either. Why do so many people still seem to think that it is perfectly okay to only behave morally towards the people in your own country (and not even that)? Another criticism Kaplan repeats (for the umpteenth time) is that Snowden praised Russia’s leaders. Indeed, arguments that use Mr Snowden’s “choices” regarding Russia against him, fail to take into consideration that by the time he pleaded for asylum in Russia, he had precious little alternatives left. No, I take that back. He had no alternatives left whatsoever. One of my absolute favourites. This apparent obsession, evident in so many similar arguments, with keeping an oath no matter what – precisely because it is being repeated so many times – is deeply worrying and, to me, utterly puzzling. It is also, to be entirely honest, a bit daft. Okay, oaths aren’t made to be broken but blind adherence to any kind of rule, directive or oath must be weighed against the moral implications and consequences of keeping that oath. “It is a fundamental truth that wrongful secret-keeping is the most widespread form of complicity in wrong-doing. It involves many more people both within and outside an organization that is acting wrongfully than those who give wrongful orders or who directly implement them, though it includes these,” writes Daniel Ellsberg, the very whistleblower who Kaplan thinks Edward Snowden isn’t like (Ellsberg disagrees). Why is it worse, apparently, to violate an oath, than to violate the law? It isn’t. And by the way, the assumption that it should be, is the daft part of the whole oath-violation-argument. Ostrich-like, it avoids the question of whether to keep the secret would have been (more) wrong and complicit in (worse) wrong-doing. More importantly, Davidson questions the notion that Mr Snowden even took an oath. None of that matters much to Mr Kaplan, it seems, as he goes on and on, repeating pretty much without fail every outdated argument against and criticism of Mr Snowden out there. Another personal favourite of mine: that Edward Snowden is a vain or naïve megalomaniac. I never understand how people conclude that. 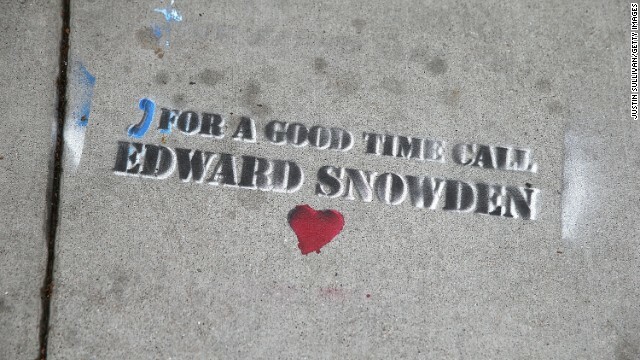 A personal anecdote: when I was first asked to sign an online petition to support Mr Snowden in June, I took a long hard look at the interviews he recorded with Glenn Greenwald and Laura Poitras to find out exactly who I would be supporting. I have kept that close look since. I have broadened it to the journalists who work with Mr Snowden and I think I have said multiple times that I have never had any reason not to believe them or to think that they are in it solely out of arrogance or for their own benefit. I suggest you do what I did: watch the Guardian’s interviews with Mr Snowden, read the Q&A transcripts and statements by Mr Snowden that have been in circulation. Read what supporters and people who have met them have written about Mr Snowden, Ms Poitras, Mr Greenwald. Take into consideration that Edward Snowden has been much less present in the media than he could have been and that he refused to sell the rights to his story to anyone. Then make up your mind if we are talking about a person that is in it for the money, a traitor, naïve or a megalomaniac. Take a good long look at how prone to hubris he really is (spoiler: not at all) and, just for fun, compare that to Keith Alexander: I wrote a post on Alexander and hubris in September last year that I had some fun with. Oh, while you’re at it: don’t forget what Mr Snowden gave up to make us all aware of these programmes. What that shows is conviction, not arrogance. As for the allegation that “Snowden gained access to his cache of documents by persuading 20 to 25 of his fellow employees to give him their logins and passwords” – last time I looked that wasn’t even verified so perhaps Mr Kaplan should go back and check his facts. So, to summarize, arguments against clemency for Mr Snowden include that he is no Daniel Ellsberg because he “praised” Russia’s leaders (misleading), that he leaked more than “just” documents about domestic surveillance (as if mass global surveillance wasn’t worth knowing about), that he violated his oath (which for some reason is worse than NSA violations of the law and the constitution), that he cheated his colleagues out of their passwords (contested) and that he did all of this because he is a deluded megalomaniac. That’s a so-called free and democratic society in operation for you. Applause. Considering the enormous value of the information he has revealed, and the abuses he has exposed, Mr. Snowden deserves better than a life of permanent exile, fear and flight. He may have committed a crime to do so, but he has done his country a great service. It is time for the United States to offer Mr. Snowden a plea bargain or some form of clemency. So argued the New York Times, setting off the debate that dominated the first week of 2014. I certainly agree that Mr Snowden has done his country a great service – and many other countries besides. I also agree that, given the questionable legal status of the surveillance programmes exposed by Mr Snowden, that “[i]f Edward Snowden is a criminal, then so are a lot of people that are working within the CIA and the NSA who have been spying illegally on American citizens” as Former Montana governor Brian Schweitzer has argued, also calling for clemency. Trevor Timm in the Guardian states correctly that the programmes “are an abuse…as long as the NSA is collecting such a vast database on every innocent person in the United States, and then searching it at their own discretion, they are abusing [the US] constitution”. Existing or planned law suits testify to the fact that many people share this opinion. As such Rand Paul, “a libertarian and potential 2016 presidential candidate, […] plans to lead a class action lawsuit against the NSA over its data collection programs. Paul claims that hundreds of thousands of supporters have signed on to his lawsuit thanks to the information brought to light by [Edward Snowden]”. It should be obvious that to acknowledge the immense importance of Mr Snowden’s revelations while insisting at the same time that he should spend the rest of his life in prison is a bit ludicrous. Even if you agree that Mr Snowden did break the law when absconding with troves of classified documents, that still doesn’t alter the fact that – potentially – the NSA and GCHQ broke the law themselves when using the programmes Mr Snowden has exposed. This week, an inquiry by the European parliament’s civil liberties committee stated that “NSA and GCHQ activities appear illegal”, condemning mass surveillance. It is because of Mr Snowden’s brave decision to expose these programmes that we are now in a position to examine their legality both domestically and internationally, and the law should be flexible in dealing with the person who made us all aware of what we desperately needed to know to protect our democracies. Calling for clemency or a plea bargain is therefore neither far-fetched, nor illogical, let alone “outrageous”, as former NSA boss Michael Hayden (who else?) has suggested. Clemency or a plea bargain – a good idea? From Mr Snowden’s point of view, I am not so sure. I cannot be the only one to whom the kind of deal Mr Ledgett seems to envision sounds like little more than a gag. So far, the Snowden revelations have made available a wealth of much-needed information on the extent of government surveillance. Who knows what else is yet to come and what, in turn, we might miss out on knowing if a deal is struck? Granted, it may seem questionable in how far the US government would succeed in gagging the newspapers Snowden leaked his documents to. And if a plea bargain is the only way for Mr Snowden to be able to leave Russia and perhaps even return home safely then perhaps he should agree to it. In my personal view, he has done more than enough. But would he be safe? I doubt it. For all his background in constitutional law and human rights, Mr Obama has shown little patience for whistleblowers: his administration has used the Espionage Act against leakers of classified information far more than any of his predecessors. It is difficult to imagine Mr Obama giving Mr Snowden the pardon he deserves. So writes the Guardian and what is more, a lot of people still seem to believe that Mr Snowden does not deserve clemency let alone a pardon. Clemency or a pardon aren’t enough. I think in light of NSA violations of domestic and international law (should this be ruled) charges against Mr Snowden should be dropped. He is not a criminal. He is a whistleblower. He should not be prosecuted. Michael Hayden has said that granting clemency to Edward Snowden would send the “wrong signal” to future whistleblowers. Wrong. Mr Hayden, that claim is outrageous. Obviously, calling for charges to be dropped is calling for the impossible. So, in my opinion, the best idea would be for the US to come to an agreement that would restore Mr Snowden’s passport to allow him to travel and seek asylum in any country he liked. Yet, given that one of the ideas behind a plea bargain may be to get Snowden back to the US I don’t really think that is an option either. It seems far more likely that if Mr Snowden does return to the US, all he can hope for is “due process” and to only go to prison for a few years, as Rand Paul has suggested. After all Michael Hayden and Mike Rogers have previously joked about placing Snowden on a kill list. I didn’t think it was funny then and I don’t think it’s funny now but perhaps the best he can hope for is to end up sharing a prison cell with James Clapper who allegedly lied to Congress. That should make for some interesting discussions. However, until someone convinces me otherwise, I am not sure any bargain that doesn’t include his getting asylum outside the US (and Russia), is safe for Mr Snowden. And here is why else clemency won’t happen. Correct me if I’m wrong but I cannot remember ever seeing the US government being contrite. So yes, someone should offer help to Mr Snowden, but it isn’t the US government. It is – and I have said this before – the countries who are seeking his help, namely Germany and any other of the EU member states (except, of course, the UK; they are too busy trying to intimidate the Guardian). This is what the consequence of the public service Edward Snowden did us all should really be, not gags disguised as leniency.